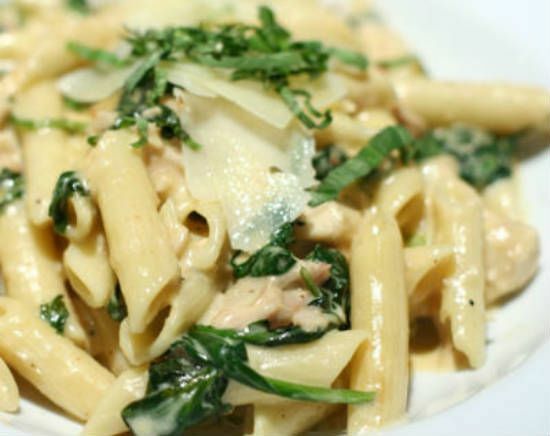 A delicious creamy pasta with chicken, spinach and cheese. Makes a perfect lunch or dinner dish, esp on a slow, relaxing weekend. 2. Pour 100 ml of the chicken stock and bring to a boil. 3. Add the chicken pieces and cook for 10 minutes. 4. Add garlic paste, cream cheese and stir until the cheese has fully melted. 5. Pour the remaining stock, spinach and tomatoes. 6. Cook for another 10 minutes, stirring all the time. 7. When the tomatoes are soft and the sauce has thickened slightly, pour this over the cooked pasta. 8. Mix well and sprinkle grated cheese on top. Feel free to comment or share your thoughts on this Chicken Penne Pasta Recipe from Awesome Cuisine.